Advance the practice of pain management to enable access to high-quality, evidencebased pain care that reduces the burden of pain for individuals, families, and society while also reducing the inappropriate use of opioids and opioid-related harms. SAMHSA also has several initiatives aimed specifically at advancing the utilization of MAT for opioid use disorder, which is proven effective but is highly underutilized. SAMHSA’s Medication Assisted Treatment for Prescription Drug and Opioid Addiction (MAT-PDOA) program expands MAT access by providing grants to states with the highest rates of treatment admissions for opioid addiction. Twenty-two states are currently funded by MAT-PDOA, and in September 2017, SAMHSA awarded $35 4 million dollars over three years in additional MAT-PDOA grants to six states. A well-documented challenge to improving access to opioid use disorder treatment is a lack of providers who can provide MAT. SAMHSA supports a number of training initiatives to increase the number of qualified healthcare providers who can provide treatment for opioid addiction. In the last four years, more than 62,000 medical professionals have participated in online or in-person trainings on MAT for opioid addiction through SAMHSA’s Provider’s Clinical Support System (PCSS)-MAT. This program is a national training and clinical mentoring project that provides mentoring of newly trained physicians by experienced specialists, maintains a library of evidencebased practice materials, and offers at no cost to the trainee the required DATA 2000 waiver training to enable providers to prescribe buprenorphine for opioid addiction treatment. SAMHSA’s National Survey on Drug Use and Health (NSDUH) provides key national and state level data on a variety of substance use and mental health topics, including 6 opioid misuse. NSDUH is a vital part of the surveillance effort related to opioids, and the data from NSDUH has been used to track historical and emerging trends in opioid misuse, including geographic and demographic variability. In addition to providing funding and technical assistance, CDC conducts epidemiological investigations (Epi-Aids) in states, providing on the ground assistance during a public health crisis. Between 2012 and 2015, Massachusetts experienced a surge of opioidrelated deaths, from 698 to 1,747, with over 74 percent of these deaths involving fentanyl. The Massachusetts Department of Public Health (MDPH) called on CDC to help investigate the extent to which illicitly-manufactured fentanyl (IMF) contributed to the surge in opioid-related overdose deaths. CDC worked closely with the MDPH, SAMHSA, and DEA to determine whether IMF mixed with or sold as heroin was the primary cause of the surge of deaths and found that 82 percent of fentanyl-related overdose deaths were suspected to have involved IMF. Additionally, CDC is conducting an epidemiologic study to assess what type of MAT (methadone maintenance; buprenorphine; naltrexone) or counseling and other nonmedication interventions is most effective, and which contextual, provider, and individual factors influence implementation, prevent relapse, and improve patient wellbeing over a two-year period. This study can help identify who may benefit from which type of treatment to ensure individuals receive the treatment best suited to their needs. To better understand the epidemic, identify risk and protective factors, and determine effective interventions, CDC also funds innovative research to prevent misuse and abuse. One CDC funded project at the Carolinas Medical Center in Charlotte, North Carolina, is working to assess and compare changes in prescribing behaviors when providers are presented with electronic alerts on potential misuse or abuse of opioids. This research will inform efforts to improve clinical decision-making. In addition, CDC funds academic research centers to conduct translational research in order to better understand how to get information into the hands of practitioners. For example, the Johns Hopkins Injury Control Research Center (ICRC) is working to reduce injured patients' risk for opioid misuse through mobile health technology while the West Virginia University (WVU) ICRC was instrumental in the development and implementation of a pilot takehome program for naloxone in rural communities. There were at least 25 overdose reversals in the first nine months of the program in 16 counties. As part of a rapid response project using CDC funds, the WVU ICRC distributed 8,250 naloxone kits to first response agencies and take-home naloxone programs throughout the state in the first half of 2017. With the goal of bringing scientific solutions to the opioid crisis, NIH is exploring ways to promote 1) new, innovative medications and technologies to treat opioid addiction and improve overdose prevention and reversal interventions, and 2) safe, effective, nonaddictive strategies to manage pain. 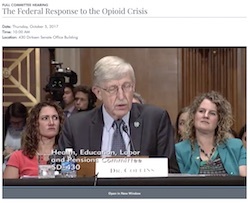 In April 2017, NIH Director Francis S. Collins, M.D., Ph.D., met with research and development leaders from the world’s leading biopharmaceutical companies to discuss new ways for government and industry to work together to address the opioid crisis. NIH continued meetings throughout the summer. As part of these ongoing discussions, NIH participated in a recent meeting with Pharmaceutical CEOs convened by Governor Christie, co-chair of the President’s Commission on Combating Drug Addiction and the Opioid Crisis, in Trenton, New Jersey, on September 18th. Some advances NIH is working to promote may occur rapidly, such as improved formulations of existing medications, longer-acting overdosereversal drugs, and repurposing of treatments approved for other conditions. Others may take longer, such as novel overdose-reversal medications and identifying biomarkers to measure pain in patients. Our goal for these activities is to cut in half the time needed to develop new safe and effective therapeutics to help end the opioid crisis. NIH will continue to build upon breakthroughs in the treatment of opioid addiction and the reversal of opioid overdose and find ways to advance the development of new products. For example, buprenorphine, one of the three FDA-approved options for MAT treatment, was developed through a partnership between NIH and industry. The intramural program of the National Institute on Drug Abuse (NIDA) conducted the early clinical studies on buprenorphine and then later partnered with industry to develop userfriendly and abuse deterrent formulations. In addition, a NIH public-private partnership helped to develop the only FDA-approved intranasal naloxone product to reverse opioid overdose, an invaluable tool to those on the front lines combating the opioid crisis. In 2013, NIDA funded a biopharmaceutical company for clinical studies to evaluate the pharmacokinetic properties – how much and how rapidly the naloxone is absorbed – of an intranasal formulation. In 2015, the intranasal naloxone was approved by the FDA. With knowledge gained from neuroscience advances, NIH researchers now seek ways to turn the tide in the opioid crisis through a wider range of formulations of existing and new medications, as well as innovative strategies to treat opioid use disorder and prevent and reverse overdose. Alternatives to Opioids for Pain: FDA strongly supports the development of new treatment options for patients in pain, especially treatments that do not have the same addictive features of traditional opioids. To advance both non-addictive and nonpharmacologic treatments for pain, FDA commits to using all of the Agency’s authorities. This includes programs such as the Fast Track and Breakthrough Therapy Designations that are intended to facilitate development and to expedite review of products that, for example, are intended to treat a serious condition for which there is an unmet medical need. As a part of these efforts, FDA is meeting with innovators who are pursuing nonopioid alternatives for the treatment of pain to provide guidance on their individual products. Agency steps also include a more careful consideration of non-drug alternatives for pain, such as medical devices that can deliver more localized analgesia. FDA is considering how to more closely fit medical device alternatives into a comprehensive approach to the development of treatments for pain. In addition to the efforts described above, HHS continues to engage with a broad range of stakeholders – state and local governments, addiction specialists, medical, nursing, dental, and 15 pharmacy providers, community and faith-based organizations, private-sector partners, community organizations, and law enforcement partners – to share best practices, build collaborations, and identify barriers that could prevent success. We are committed to this fight and will continue to advance a multi-pronged strategy, never forgetting that behind all the statistics are individuals, families, and communities who are being torn apart each day. Our guiding vision must be to improve the lives of all Americans who have been touched by this crisis. That will be the true measure of our success.